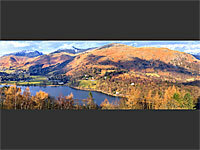 This screensaver features 4 high resolution Lake District panoramic images which scroll across the screen. If you like the screensaver, please use the social networking buttons above to spread the word! If you have any comments or questions, don't hesitate to contact me via the Feedback page. 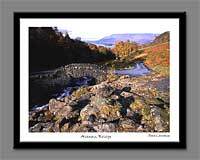 Follow me on Facebook to see my latest images, plus news of special offers, etc. A view from the Grasmere - Elterwater footpath which includes Grasmere (Lake and village), Rydal Water, Helm Crag, Seat Sandal, Dollywagon Pike and Great Rigg. A view from Side Pike of "The Langdales", including Crinkle Crags, Bow Fell, Harrison Stickle, etc. A view of Great Gable and the surrounding Fells taken from between Great End and Scafell Pike. A view from Crinkle Crags, featuring Scafell Pike, Sca Fell and Bow Fell. 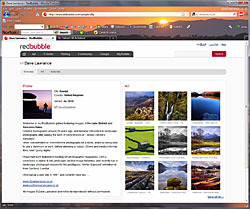 The screensaver runs on Microsoft Windows only (Including Window 7 32 & 64 bit), and is optimised for a screen resolution of 1024x768 or higher. (It will work at 800x600, but a higher resolution is recommended). Note for widescreen users: A new widescreen version of this screensaver is available now which fixes the problem of the screensaver not filling the screen. To Install . . .
Click the download link below to download the file to your computer, and choose "Save" to save the file to your PC. Run the file, following the on screen prompts, and you are done. The screensaver should be installed by default as your current one, though this may be changed via your display properties. The screensaver may be un-installed via the control panel> Add/Remove programs ("Programs and Features" on Windows 7). The screensaver runs on Microsoft Windows only, (Including Window 7 32 & 64 bit) and is optimised for a screen resolution of 1024x768 or higher. (It will work at 800x600, but a higher resolution is recommended). Run the file (lakes_dales1.exe), following the on screen prompts, and you are done.